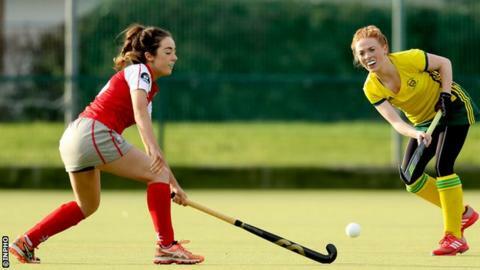 Pegasus kept up their title challenge in the Women's Irish Hockey League with a 1-0 win at Railway Union on Saturday to remain in third place. Lucy McKee's goal means Pegasus are just four points behind leaders Cork Harlequins, who beat Ards 5-1. Belfast Harlequins drew 3-3 with Loreto after leading 3-0 at one stage. In the Men's IHL, Lisnagarvey lost ground on the leaders after after they were beaten 3-1 at home to defending champions Three Rock Rovers. Annadale and Cookstown drew 1-1 and Banbridge slumped to another defeat at the hands of Monkstown. Pegasus continued their fine start to the season with an impressive win in Dublin over their hosts. McKee's goal means the Belfast side remain in third place and just four points off the leaders with a game in hand. Cork Harlequins moved above UCD, who play on Sunday, and into first place with a 5-1 home victory over Ards. Roisin Upton opened the scoring for the home side with Naomi Carroll on the scoresheet twice in the third quarter along with Olivia Roycroft. Chloe Brown grabbed a consolation for Ards before Yvonne O'Byrne rounded off the scoring. The game between Belfast Harlequins and Loreto faced a last minute switch from frozen Deramore to Grosvenor Grammar School In East Belfast and there was plenty of controversy during the game, which finished 3-3. Zoe Wilson scored from a penalty corner to put Harlequins ahead at the interval before Jenna Watt's five individual effort and another from Jenny McAuley seemed to have secured the points. However a pair of penalty strokes, the second of which was awarded despite protests by Harlequins that the ball had been played with a back stick by Loreto in the build-up, were both converted by Hannah Matthews and the same player was on hand to hammer home the equaliser from a penalty corner in the final minute. That decision was also hotly disputed by Harlequins players, who believed the infringement had taken place outside of the circle. In the Men's IHL, leaders Glenanne continued to win close games by coming from behind with two goals in the final three minutes to turn a 3-2 deficit into a 4-3 victory over Pembroke. They maintained their four point advantage over Three Rock Rovers, who defeated third place Lisnagarvey 3-1 at Comber Road. The Ulster side are now ten points behind Glenanne albeit with a couple of games in hand. Michael Kerr gave Cookstown the lead in their Ulster derby against Annadale at Strathearn School but Rhiley Carr rescued a point for the home side with a strike from a penalty corner. Cookstown's advantage over bottom club Railway Union is now just three points after the Dublin side recorded their first win off the season, beating Cork C of I 2-1. Despite late goals from Jamie Wright and Fraser Mills, it couldn't stop Banbridge from losing again at home as they were beaten 3-2 by Monkstown and are now just four points off the bottom of the table.